Synherbs®16P926 is a patent pending WECMEP (Water Extract of Complex Mix of Edible Plants) which has been elaborated scientifically using Alphanosos’ genuine Artificial Intelligence based discovery methodologies. It allowed for the first time to discover purifying synergies among many billion edible plant mixes possibilities. This 100% natural active is obtained using processes without chemical solvents and is extremely environment-friendly. Associated to a natural thickener, Synherbs®16P926 creates a favorable environment on the dog’s skin so that persistent irritation sources can be resolved efficiently and naturally. 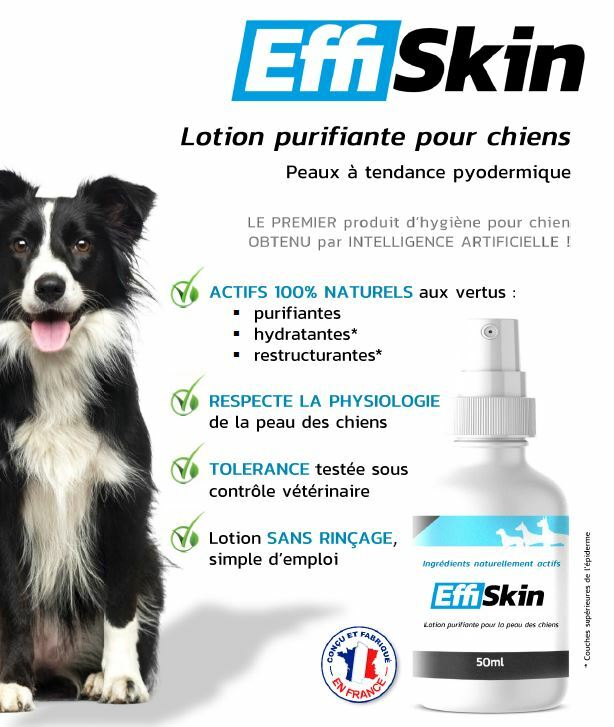 Effiskin® also contains natural restructuring and moisturizing agents to improve skin hydration (superficial epidermal layers).